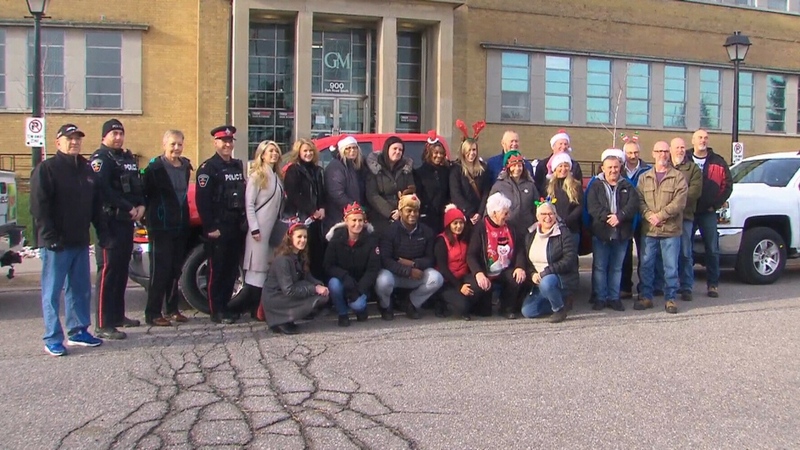 Despite having been told just over one week ago that their assembly plant will be shutting down production in December 2019, General Motors workers in Oshawa, Ont., went ahead with their annual Christmas tradition -- now in its fiftieth year -- of giving toys to needy families. The toys they donated filled the backs of newly built GM pickup trucks and were brought to a local children’s foundation where they helped 45 families and 100 children. Sharon Clark first started the General Motors holiday toy drive back in 1968 while she was working as a file clerk at the Oshawa assembly plant. General Motors announced last week that it would be pulling the plug on five factories in Canada and the United States, the latest in a series of cost-cutting efforts and a shift towards electric and self-driving vehicles. Toys are packed into the back of a pickup truck at the annual GM toy drive, Wednesday, Dec. 5, 2018. Community members pose for a picture after gathering donations for the GM toy drive.